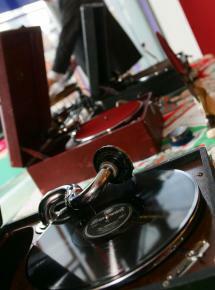 Their gramophones are in fantastic condition and the sound reproduction will amaze you. The music is all on original shellac recordings and we provide the highest “low-fi” you’ll ever hear. The wonderful atmosphere is created instantly as soon as they start playing and can adds a special edge to your event. For small venues such as a pub or your back garden the players can just be used acoustically. For larger events in halls, marquees and fields, they amplify the players through our state of the art PA system. If your having a party really out of the way or an eco-friendly wedding we can still provide amplified entertainment anywhere you want without a generator. If you’ve hired a PA for your event we can easily give your engineer a feed to use. They play at variety of events including garden parties, birthday parties, weddings, book launches, shop launches, pubs, festivals, museums, specialist music nights and many corporate events. to dress up and have a huge wardrobe to compliment our music and we come with all kinds of paraphernalia to dress the set. For a formal “Black Tie” dinner to a summer garden party we’ll fit right in.